I’m hoping I can get all the smart people in my network to add to this little (asynchronous) brainstorm. For some time now I’ve been wanting to develop a rubric for measuring the amount of flexibility in online courses. I’m particularly interested in how the course design and student requirements relate to providing students with a reasonable amount of time flexibility for their online course work. All the data that I have collected over the years from online students indicate that time flexibility is the number one reason that they enroll in online courses. Not cost, not distance, not even preferred learning methodology; but clearly they place a premium on having time flexibility that allows them to fit higher education into their otherwise busy lives. UPDATE (4/23): This will probably not result in an actual rubric. I’m having a hard time figuring out the lousy-good-better-best type of hierarchy that you typically need for a rubric. Instead, I’m thinking that the output will be a list of effective (or maybe “promising”) practices for ensuring time flexibility in an online course. Please keep the comments coming. The purpose of the rubric is to come up with a way of measuring the flexibility in various online courses, and to encourage more flexibility rather than less by those who are using the rubric. I have no doubt that some online students are frustrated when they enroll in an online course with certain personal expectations about flexibility, only to find that the course offers them very little of it. These are some of the factors that come to mind for me. Added 5/3/12 from comment received: Online courses should have a rhythm or consistency to them as to when things open, when they close, how large the windows of opportunity are, etc. Too little content provided means students have to spend time hunting down relevant content that allows them to achieve the required outcomes. Too much content provided typically includes content that might be on-topic, but not relevant or useful in achieving the required outcomes,; causing students to spend time filtering through the information (a case where the instructor throws everything but the kitchen sink at them). One of the keys to this type of rubric will be to walk the fine line between enough flexibility and too much flexibility. An extreme example of “too much” flexibility would be those cases where there are no deadlines at all in the course except for the course ending date. This might work for an electronic independent study course, but not for online courses where learner interaction is expected and/or required. 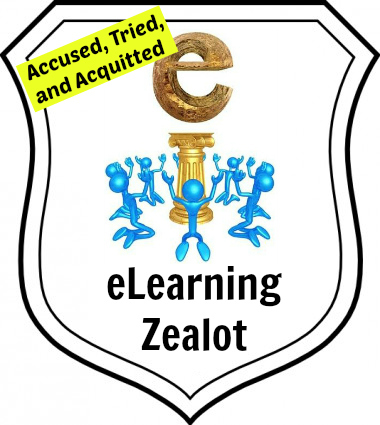 Based on my past online teaching experience, I find that I am in agreement with many faculty members I know who state that you must keep students engaged with the course every week (and probably 2 or more times per week) in order to not have them fall off the face of the earth (fall behind and drop out or just quit). I’ve thought about including other types of flexibility rather than those focused on the students’ time availability. I’ve decided not to tackle those right now. For example, it might be interesting to include things related to the nature of assignments – do they allow students to choose different assignments or different methods of completing the assignment (write a paper, make a movie, make an oral presentation, etc.). I think that’s interesting, but I don’t think it captures the reason that students take online courses – which is clearly time flexibility. Determining the specific parameters for each rubric item is yet to come. Right now I would love to have your input on other factors that could be included in a rubric to measure time flexibility for online learners. 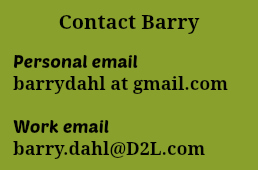 Please leave your thoughts in the comments or email me at barrydahl at gmail. Thanks in advance, and yes, I realize this could be a colossal failure. I’m okay with that. 1. I overlap modules so there isn’t a single time when one starts and the next begins. For example, I’ll open module 2 on Sunday morning, but module 1 assignments aren’t due until Monday afternoon. 2. 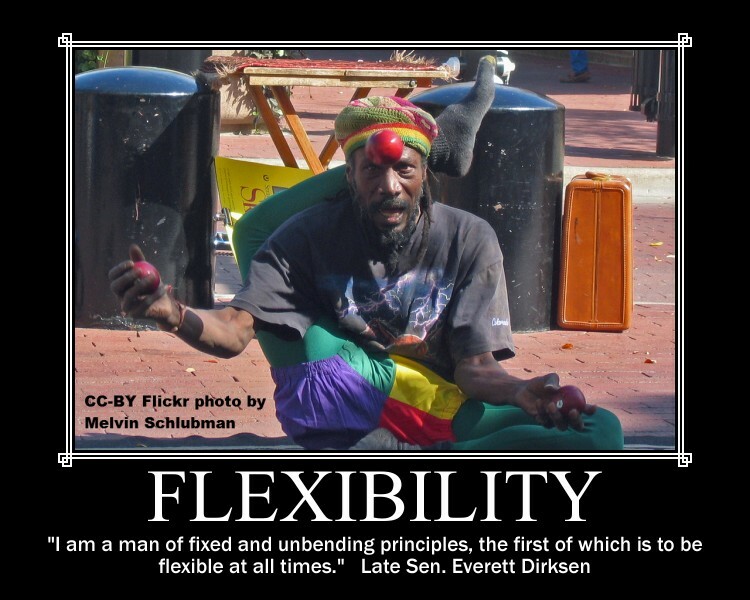 I provide a flexible weekly portfolio activity. Students need to demonstrate their learning, but they can choose the method and medium. I state up front that I understand some topics are more engaging to them personally, and they may want to do a deeper exploration and create something. Or, they may have personal events that get in the way, and may want to just write a blog reflection. 3. For unrequired synchronous online sessions, I open participation to my larger network, this way if some students don’t show, there is still opportunity for engaging conversation. This makes for a more valuable recording for people who need to watch it later. I also post highlights of the sessions so students know their value before they waste time with a recording that may not be of use to them. 4. In my syllabus, I give them the opportunity to suggest alternatives and present a strong case for any assignment they don’t feel would be the best way to assess their learning, or help them learn. 5. I encourage students to read terms of service for any tools I recommend, and if they disagree, present the case and suggest alternatives. 6. I provide a discussion area for students to help each other, rather than wait for an instructor response. 7. I don’t require a certain number of posts, by a certain date, and a certain length or format. My “micro-post” rubric looks for connections to prior knowledge, introduction of new information, and empathy for peers. 8. If a student gets behind in the course, I allow them to make up everything without penalty, except for the loss of participation points. I am really curious what you will end up with – I have worked on this A LOT in my classes, trying to find a sweet spot of student independence but also a sense of togetherness as a class. I’m pretty happy with how it has ended up and out of the appx. 2000 students who have passed through my courses, only one student has managed to basically twist the system to such an extreme, opting out of the togetherness, that she made the class a very isolated experience – but that was her choice and, as I got to know her, she had some reasons of her own for making that choice which I was certainly sympathetic to. I don’t think she would have been better served by some constraints having forced her to choose otherwise. By and large my students are really grateful for the enormous flexiblity but also pleased and surprised at all the opportunities they have to interact with each other in addition to interacting with me. They all interact with me (through their projects), so that’s not a problem – the real trick is how they interact with each other when they are on their own schedules. One thing I would suggest as a strategy is that as you measure time flexibility you also measure interactivity. That, I would guess, will give the best overall measure. If a teacher is just a hardass about deadlines but is not doing anything to promote student-to-student interaction, what’s the point? If, on the other hand, there are time constraints in the class which exist in order to promote student-to-student interactivity, then I think that’s a fair trade-off. Your list is already very comprehensive. From my own classes, I would add this – for the assignment where there is a real time constraint (and in my class, it is the blog responding assignment each week, where there is just a three-day window for that – everything else can be done early, but not that one simply because of the large number of students who post at the last minute), I offer a no-questions-asked extra credit option every week that equals the points for that time-constrained task. So, if someone is out of town or just for whatever reason not able to do the blog responding in the window, there’s always an extra credit option they can do instead so they are not taking a hit on their points as a result of a scheduling problem. Looking at Jen’s great comment also, I have to admit that I see flexibility as allowing students to work head; if students get behind, I have some extra credit allowing them to make up missing work but what I urge instead is that they work ahead so that if something does come up, they will have a cushion allowing them to take time off. I don’t give extensions except for medical emergencies. Instead, everything can be done early (several weeks early, if people want) – and there is extra credit each week that can be used to make up for missing assignments and/or to build up a cushion for the future and/or finish the class early. You will see there a link to a blog post from some years ago where I asked one semester’s worth of students to leave comments for future students, and the #1 recommendations were to work ahead and take advantage of the extra credit. I figured such advice would be more meaningful coming from other students than just coming from me, ha ha. Another flexibility thing I just thought of is that I let students stop whenever they reach the grade they want – A, B, or C. Since it’s a points-based grading system, they reach the points they need for a grade and that’s it. So, for students taking this as a Gen. Ed. class, swamped with stuff in their other classes, it’s fine with me if they stop with a B or with a C, since all they need to do is pass the class. Oh, I also START the class one week before regular classes start. That’s a great way for students to get ahead, literally before they have any other work at all in their other classes. It’s optional of course – I would guess around one-half of the students opt to begin the class early. Thanks Jen and Laura. Both of you have given me a great deal to think about. I wasn’t convinced that this was going to end up in rubric form, but I thought I’d give it a shot since everyone seems to want a damn rubric for everything. Right now I’m leaning toward more of a list of effective practices that should be considered to create a learner-friendly course that allows students at least a minimum degree of flexibility without turning it into a correspondence course. Great stuff, and thanks again. I’m intrigued by your idea for a flexibility rubric. There isn’t anything in your thinking so far that doesn’t ring true from my own experience and perspective. However, I do have a couple thoughts of my own to add. In designing my online courses, I always followed two “design” principles. My first principle was to always include, if at all possible, a four day period over a weekend (i.e. Friday, Saturday, Sunday, and Monday) in my students’ “window of opportunity.” Over the years I noticed that some students did a majority of their work over the weekends while others did very little work on weekends, concentrating their work on business days. Thus, my window of opportunity allowed them to choose from two weekdays and two weekend days to do their work. Maximum flexibility! My second principle was, again to the maximum extent possible, to create a predictable “rhythm” within the course through consistent scheduling. Thus, for example, quizzes would always be made available at the same time on the same day of the week (e.g. 6 a.m on Friday) and be due at the same time on the same day of the week (e.g. 11:55 p.m. the following Monday). The next unit might always become available at 6 a.m. on Sunday with all work on that unit to be concluded by 11:55 p.m. the following Sunday. I see the two principles as in tension with each other. Scheduling flexibility is great, but it also tends to facilitate procrastination and oversight. In contrast, predictable scheduling makes it easier for students to establish a routine or habit, in turn supporting the self-discipline needed to stay on schedule. It’s unclear to me how any of that would fit into the type of rubric you have in mind and you didn’t make it clear where you’re going with this, but I look forward to whatever results. As I replied to him, I don’t think his two items are necessarily in tension with each other. In fact, I think the consistency/predictability piece is an important component to the learner flexibility – so they are not surprised by schedule changes that don’t fit into their already heavy schedule. That’s something that I had overlooked, but I think it belongs here. @laura I asked my students if they wanted me to open modules up in advance, because I didn’t want to force people to think linearly. I thought they might find a topic from an early module that got them curious about something later they’d like to check out early. They overwhelmingly asked me not to open modules early. They thought it would be too distracting. They liked the predictability of having a rhythm for when the next module was opening. They did have all the topics and assignments from the beginning, but none of them wanted the option of moving head. It was a very small class, so I think they also wanted to stick together, so the resources they shared were relevant to the current discussion. Another thing that improves flexibility is the way you use the discussion board. Requiring students to all answer the same question gives a huge advantage to people who are able to post early in the module. Students who are late to the work are forced to try to come up with something original, so it doesn’t look like they’re copying an earlier post. And if you use LMS tools to require post first, then comment, you may as well just have people submit their answers to a drop box. It’s not conversation. I spend a lot of time with instructors helping them develop a more conversational tone, and at the same time model their own learning. When we have conversations, we don’t just have one person pose a question, and everyone take turns answering. It needs to flow online, as it does in person. I encourage professors to either do video or text reflection along the lines of, “So I’ve read this stuff a hundred times, and this is the first time I realized _______. I think maybe it had to do with something ____mentioned last week, that got me thinking about ______. And that led me to search for ____ and I found this article ______.” It’s very difficult to get them to transition to this, but very rewarding when they experience the results. Jen, as I mentioned, it’s maybe just around 10% of my students who are really serious about working ahead, but I am glad to accommodate them. There’s nothing distracting about having modules open in the lms we use (everything is time ordered anyway, so the current week appears at the top, then the next week and the next and so on). My course also has a strong “mix and match” feel to it – every week there is a choice of two readings anyway, and if students don’t find either option appealing and want to skip a week and move ahead, that’s actually fine with me as long as they cover the work required for the grade they want in the end. There’s nothing sequential about the reading units; each is a stand-alone (I teach folklore & mythology: http://www.mythfolklore.net/3043mythfolklore/). It’s a quite large class, around 50-60 students, so I like to offer a range of options that match the wide range of students (people who are totally into the class, people who are just there to pass it as a Gen. Ed. requirement for graduation, etc.). I don’t use discussion boards at all since the emphasis in the class is on storytelling and creative writing. So, that allows for a lot more flexibility – if people were working ahead and then had to participate in a discussion about stuff they had read a couple weeks ago, that could get awkward for sure. But my students are blogging each week about what they read, creating their own stories based on the reading and also writing about the writing process itself. So, again, nothing sequential, nothing time-sensitive, which means that if they write the blog posts in advance, there is no harm done when students get around to commenting on them later, and likewise no harm done if they are going back and commenting on blog posts from a unit they have already completed. So, for the kind of topics I’m teaching and for the content the students are creating, time sensitivity and synchronization is not much of an issue, thank goodness. I really appreciate the flexibility that online courses give students – esp. student athletes, for example, who sometimes have monstrous travel schedules – and I’ve designed my courses to take full advantage of that time flexibility as much as possible without sacrificing the student-to-student interaction.